and the fact that the felt-like leaves were once used for lamp wicks. with felt-like, silvery gray leaves and stems, growing up to 3 ft. tall with a spread of 18". of brightly colored rose-pink or scarlet 1"-1¼" flowers. 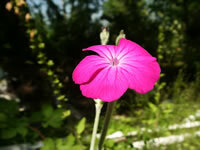 Rose Campion plants are hardy in USDA zones 4-10. Arkwright's Campion, (Lychnis x arkwrightii) grows to about 20" tall with a one foot spread. 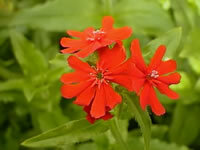 abundant, brilliant reddish-orange, 1½" flowers in early to mid-summer. Arkwright's Campion is hardy in USDA zones 6-8. Campions grow best when planted in an area that receives full sun to partial shade. In regions with hot summers, they will require shade in the afternoon. Plant your Campions 15"-18" apart in any average, very well-drained soil. They will not tolerate wet feet in the winter! especially if they are grown in full sun. Campions prefer cool feet, so add a good covering of mulch around the base in hot summer areas. and your plant may flower again in the fall. Because Campion plants are relatively short lived, they should be dug and divided every 2-3 years in the spring, to keep them growing vigorously and to provide you with additional plants. Campion plants self-sow readily. Thin and transplant seedlings in the spring. Campion seeds require light for germination so do not cover them! last expected frost in the spring, or in late fall. If starting your seeds indoors, the seeds will need to be chilled in the refrigerator for three weeks before planting. Maintain a temperature of 70° in the growing medium until germination, which takes 20-25 days.